Aaila Ali is a third year undergraduate student studying Physics at DePaul University and Computer Engineering at the Illinois Institute of Technology. She joined the DePaul University SPS chapter her freshman year, becoming an officer the next year, and served as president of the chapter over the 2017-18 academic year. Aaila worked to organize events to create a nurturing community to help advance physics students of all backgrounds in their professional development and academic success. She successfully turned the previously quiet chapter into a welcoming community and resource for all students. Her primary chapter goals include finding ways to support students looking for opportunities to perform undergraduate research and present research at conferences. Professional development workshops, technical workshops, and fundraising have allowed her to promote those goals. She has also worked to bring the Chicagoland SPS community together through city-wide SPS events and collaborative research projects. 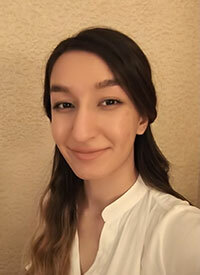 While balancing coursework and community involvement, Aaila has worked on computational cosmology research under Dr. Jesus Pando at DePaul University, and won an Outstanding Physics Poster Presentation Award on this research at the 2018 Illinois Louis Stokes Alliance for Minority Participation (ILSAMP) Symposium. Aaila is currently taking part in an REU in experimental condensed matter research at the University of Utah under Dr. Christoph Boehme, and plans to pursue a PhD in the field of Quantum Computing.